There’s been tons of hype in recent years about what toxic ingredients your skin care products are made of. Are you aware that the ingredients in your skin care products may not be safe? Many of us have never stopped to consider the ingredients in our cosmetic products and how they might be affecting our appearance and our overall health. The good news is you can know exactly what goes into your products! When I was working on the Vitamin D series, I was reminded that the website The Environmental Working Group (EWG) has put together a site called Skin Deep. They provide a searchable Cosmetic Safety Database that I recommend everyone using skin care products dive into. 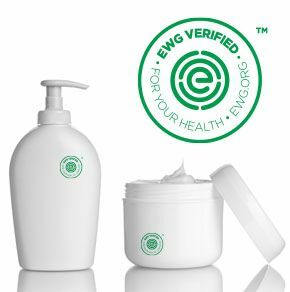 At Skin Deep, the EWG reviews thousands of brand name and generic beauty products and divides them into the following categories: Makeup, Skin, Hair, Eyes, Nails, Babies, Oral Care, Sun Protection, etc. The products are rated on a scale of 0-10, 0 being the lowest hazard and 10 being the highest hazard. Do a little experiment for me. Go into your bathroom, grab the three products you use most, and search for them on the Skin Deep database. Find out if your products have been reviewed and, if so, where they rate on the safety scale. If you have never before taken the time to consider what your beauty products are made of, or if it’s been a while, I encourage you to browse through the pages at Skin Deep and be inspired to do some more research. It may also inspire you to begin making your own skin care products at home. Why should you spend time making your own skin care products? 1. Making your own skin care products at home will provide you with safer, more personalized products. Every one has different needs and you know best exactly what your skin issues are. You might be dealing with early signs of aging, have dry or sensitive skin or even combination skin. Natural ingredients, as close to their raw form as possible, are always better than their chemically manufactured counterparts. By making your own, you get healthy, customized products that meet your own personal needs. 2. DIY skin care products are thrifty. I’ve read that the average American family spends around $2,000 a year on their skin care and hygiene items. These same products, when homemade, require fewer ingredients and often last longer than the store bought brands. 3. Homemade skin care products make great gifts. My most cherished gifts are those that were made by the giver. Homemade gifts tend to be more personal and more appreciated for the thought, time, and effort put into their creation. My girls love to make and give homemade beauty and skin care products and their friends are always super impressed! 4. 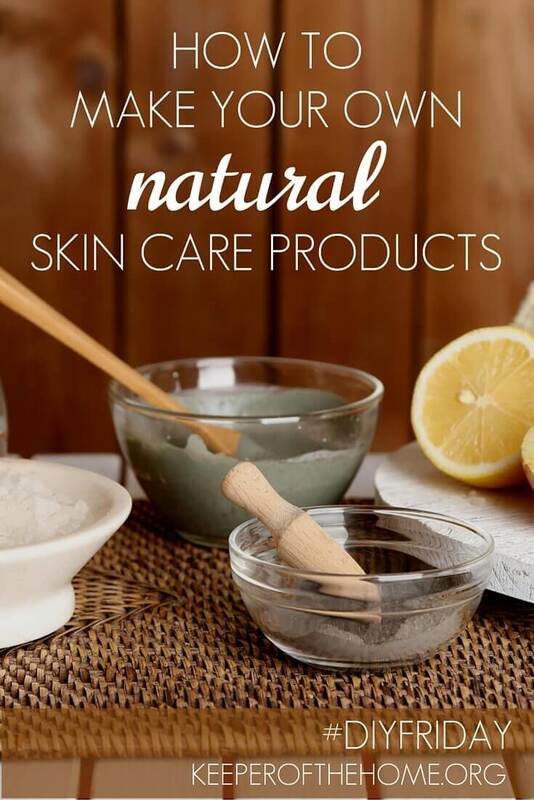 Homemade skin care products don’t put harmful toxins into the body. According to the EWG, only a small percent of cosmetic ingredients sold in stores have been tested for safety by the cosmetic industry. Are you really going to trust the profit-driven cosmetic industry to use only ingredients that are good for your long-term health? The EWG has great tips for ingredients to avoid. Their Top Tips for Safer Products recommends avoiding triclosan and “cancer-causing” parabens, as well as any fragrances. You can find more detailed information on what to avoid and why at Skin Deep. Not many of us have tons of time to sit at home and research every ingredient we come across. The point is, be mindful of what you are putting on your skin and especially your babies and children. Do as much research as you can. And know that we are here to help! You’ve got this! To get you started, here are a couple of products that you can easily make at home, and a video to show you just how easy it is! Body Scrub: These are super quick and easy to make a variety of scents to suit your taste. They provide exfoliation and are wonderful moisturizers. Olive oil is one of the simplest, purest moisturizers in the world. It’s wonderful to use anywhere on your body, including those extra dry spots like your elbows, knees and heels of your feet. Keep in mind that just a tiny bit of olive oil is needed. The old adage is true: ‘a little bit goes a long way’! Using too much olive oil will leave you feeling and looking greasy. Something I use daily on my face whether I’m wearing make-up or not is coconut oil. I have found coconut oil to be one of the easiest and best ways to remove eye makeup while moisturizing and destroying bacteria (good-bye pimples) on the thinnest and most easily damaged skin on my body. Apply 1-2 drops honey to wet fingertips and then massage onto razor burn area or wet face. Do not rinse. Pat dry. You may be surprised to find that using honey on your face will not make your skin feel sticky. Honey actually helps the skin retain moisture, plumps up fine lines and gives your skin a beautiful, radiant glow. Using half a lemon, massage it onto each elbow once a day. Dry your elbows with a towel and then apply a small amount of olive oil to moisturize. You will see fast results. Bring 1 cup of water to a boil and add 1 teaspoon of plain gelatin, stirring until the gelatin dissolves. Store mixture in a spray bottle. When ready to use, place bottle under hot water in your sink before use as it will solidify. Safe for your body and the ozone layer! Easy and effective! Use coconut oil on your sweet baby’s diaper rash instead of chemical laden rash creams available in stores. Mix all ingredients together over low heat. Pour into small containers. Take a closer look at ingredients in the beauty products you are currently using in your skin care routine. Consider switching to safer, store bought alternatives or even begin making your beauty products at home. You can do it! It’s not as hard as it might seem at first! 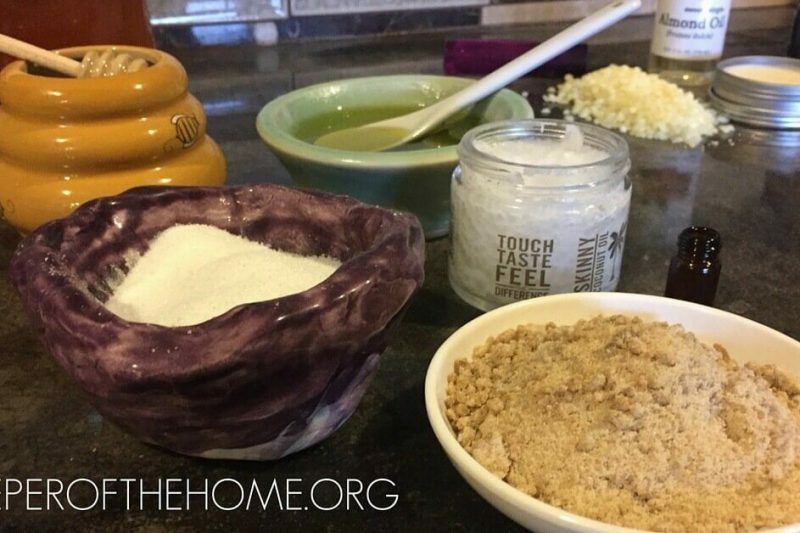 Simply start researching recipes for homemade skin care and beauty products and check back frequently at Keeper of the Home for more posts on this topic and how to find the ingredients you need to make your own. 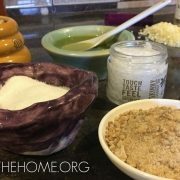 Do you make your own skin care products? What variations do you like to make? Thank you for the valuable info. I am determined to try making my own. I think you will be very pleased Diana, let us know if you have any questions!